This video from Cooking Up a Story is right on target except for one thing and you probably know what it is. Of course, these salad bowls should be sub-irrigated planters (SIPs). They will be far more productive and built-in water reservoirs will significantly reduce the risk of drying out. Small planters like these salad bowls are high risk for fatal desiccation. I see wilted plants in drain hole planters all over my neighborhood here in Brooklyn. There are wilted plants everywhere. It is a sorry sight in the heat of the summer. The video reminds me of an old expression in my sales career and it is; “every disadvantage, an advantage”. It’s about flipping negatives into positives. There is a small business opportunity here created by the ultra conservative mindset of the garden center industry. A SIP salad bowl business could be a home based business or one that is associated with an existing retail business such as a florist or hardware store. It would not take much of an investment to start a business like this. It could be a door-to-door business run by high school teenagers or college students. It would be interesting to know the fresh vegetable production (and street value) of this back yard garden, excuse me farm. What we see here could well be a family small business selling both vegetables and ready-to-grow sub-irrigated planter (SIP) gardens. Read about someone already doing it. Think about all the unemployed teenagers and college students we have in America who could produce some significant fresh food and income over a summer if they knew how. The key is education about modern methods of urban food production that does not require tilling scarce and often-contaminated land. Currently this information is not available and that is a national disgrace. Third world countries get better information (micro gardening for example) from the UN Food and Agriculture Organization (FAO) than we do. The USDA is not funded or mandated to teach you as an urban or suburban citizen how to grow your own food using the most modern productive methods. It is funded by tax dollars and supported by lobbyists whose sole interest is in promoting corporate agriculture. That does not include you. Instead of modern up to date consumer information, the USDA through its Extension and Master Gardener programs spreads outdated information about dirt and drain hole gardening. Sadly, urban foodie and dirt hugger bloggers and writers drink their cool-aid and spit it out all over the Internet. The blind end up leading the blind. Almost every day I see photos like this one about job training. Well intentioned perhaps but dumb and dumber. Working in a MacDonald's or Starbuck's is probably a better job than this. The expression "dirt cheap" isn't just about the dirt; it's also about dirt-cheap jobs that lead nowhere. Green jobs? From what I observe here in New York City, most of what are being called green jobs are more brown, as in pick and shovel jobs. It may be work, but it is low paying work and no better than fast food jobs. Dirt farming in the city has a place but surely doesn't qualify as a significant source of green jobs. In my view, nuevo victory gardeners and fantasy farmers are living in a dream world of a bygone America. There are some interesting points about green job hype raised in this post. I found it worth reading and agree that without a national manufacturing strategy, we have a very tough row to hoe. I don't know the figure myself but someone should compute how much of every federal $ committed to non-agricultural, non-nuclear renewable energy sticks inside the U.S. vs. how much leaks out to Germany, China, India, and Scandinavia. There have been hundreds of articles about so-called green jobs, or green collar jobs that are supposedly just over the horizon. They usually involve solar panel installing, weatherization or urban farming (as in digging dirt). There is no future in dirt. This is the most interesting projection of future new job ideas that I have seen. These are really cool jobs in my opinion. They aren't vaporware ideas like so many I've read. The list comes from a very progressive website in the U.K. called Science So What. Note Dream Job No. 8. In my opinion it should be broadened to include sub-irrigated planter (SIP) systems and home hydroponic and aquaponic systems. This field of consumer food production systems has enormous potential. It probably justifies its own separate category. With the help of the team at Fast Future Research, Science: [So what? So everything] has looked at potential developments in science and technology over the next 20 years and identified 20 jobs we could be doing as a result of these advances. Tom Friedman who perhaps speaks for me more than any other journalist thinks the fat lady has already sung. I hope he is wrong, but am fearful he has it right. My life spans the period of time he talks about in his op-ed piece of February 20. My emotional immaturity as a teenager led to a very untimely pregnancy while still in high school. Yes, I know it is quite common today, but not at that time. Thanks to an evening school training program by Grumman Aircraft, I became a machinist while earning my degree at Hofstra evening school. I bought a house at nineteen and had three children by the time I was twenty-one. Try doing that today. Thanks to our post-WWII manufacturing economy, I was able to survive and eventually prosper. I think often today about the reality that I would not be able to do what I did then in today's America. 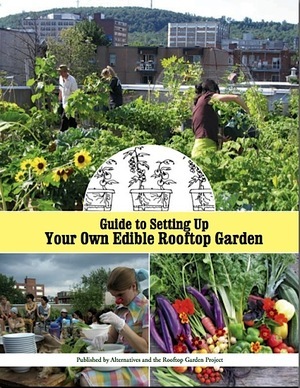 The Rooftop Garden Project in Montreal produced what many believe is the definitive guide to edible rooftop gardens. It is by no means just a rooftop guide. It is applicable for any urban garden whether rooftop or surface level. Scan through it and you will quickly see that it is a professional document. This dedicated and focused non-profit group has done an amazing job of advancing urban greenscaping through the use of modern sub-irrigation methods. They are continually testing, modifying and improving their methods. My plan is to use their work as the teaching guide for a community college certificate program in urban greenscaping. An urban greenscaping certificate program would teach all aspects of greenscaping in the city including edible, decorative and flowering plants. It is much more than just plants however. Urban greenscaping also includes subjects such as rainwater harvesting, composting, recycling, reusing, fabricating and solar power. There are many elements of construction work involved with urban greenscaping.